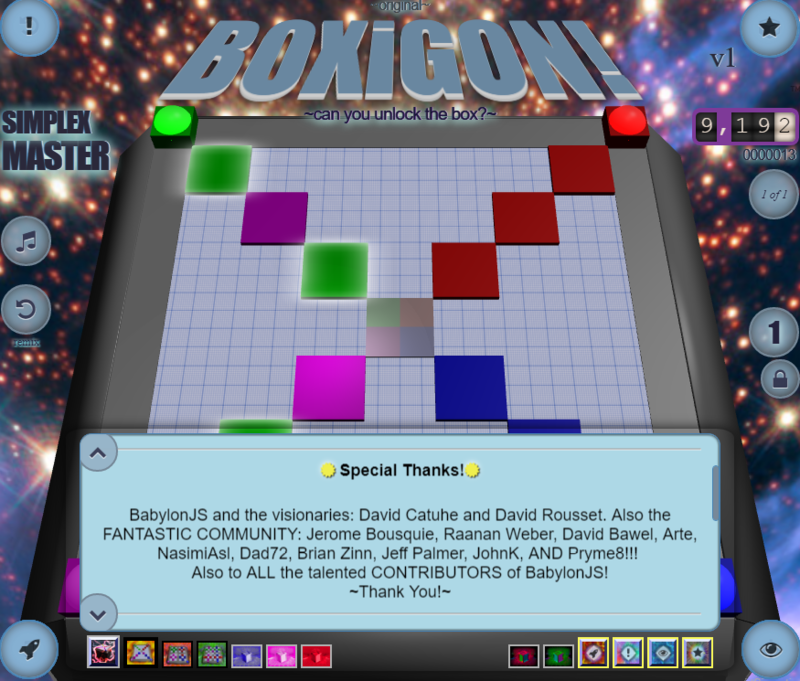 Awesome HTML5Dev community..: BABYLONJS on STEAM!!! GOAL: the entire purpose is to TEST THE HTML5 MARKETPLACE. - attempt at FaceBook "Instant"
- and braving the "HTML5~Portal~Jungle"!!! PURPOSE: figure out the "3DWebPipeline" then BabylonJS (Cinematics) "Episodic Visual Novels" - ready to roll. Post here if you have questions or comments. This is so COOOOOOOOOOOOOOOOOOOOOOOOOOOOOLL!! Thanks a lot team! This is so kind of you and I'm so proud of all the work you achieve! I wish you a LOT of success on Steam! And thank you so much for your best practices article! Two weeks on STEAM for only a handful of sales. Organic interest, not sales. That is ok.
BOXiGON V1 purpose is to prove pipelines. So, decision to skip facebook gameroom for now. And we built a DAC .appx Bridge App for Windows Store UWP, verified... and attempting approval now. Decided to Capture -> Best-Practice Retrospective -> HERE. Like before. Will cover STEAM and Windows Store, Facebook ... below. Overall idea is to build out a pipeline then send BABYLONJS puzzle games down it - to the best market. 1) prove pipeline for STEAM, Windows Store, Facebook, AND Amazon. 2) mobile version. Possibly word game, with WebGL practice (in pipeline). DEPENDS ON PLATFORM. 3) Then Episodic Adventure Cinematics - with BabylonJS. We decided to pull plug on MS App Store. "UWA" process to get "Bridge-App" Build to "appx" with "DAC", set up *many "Environment Variables" to 3gig(!) SDK, and then sign cert 'crt', multiple rebuilds from cheesy Naming Convention requirement failures (not well documented), plus dashboard failures on taxes (over spaces), old docs mixed with new docs. And then on step 99/100, final error when ready to 'Upload App' --> 'Something went wrong. Try refreshing your browser." Lol! Submit button disabled. Customer service chats, up until "PSR" for engineering to troubleshoot on my system? Repush same build, same error. And ... out of time. : ) AND through all that -> didn't find PWA (which is what I was searching for all along). Skipping App Store Stack all together. Big (app store) Elephant -> doesn't fit requirements. Need marketplace to be easy, quick, and flexible... like open-source JS. We need delivery to be Episodic. STEAM - little organic interest in a massive crowd of great games. WINDOWS - long process and bugs. FACEBOOK - suffocating security blanket. AMAZON - "Does not support WebGL" while docs say it does. Needs SSL. UPDATE - didn't find a FREE solution (good advice below) had to plunk down $ (checked 3 hosts Heroku, NameCheap, GoDaddy). UPDATE: optimized (SSL) render through Heroku - PASS! UPDATE: Facebook gaming platform is massive.... with "GameRoom" sdk, for native. The relatively new market on FaceBook in 2018, is called "Instant Games". Giving that a try! UPDATE: new security hurdles - fyi. Good News (if you've not seen): BABYLONJS is at the TOP of compatible games!!! In an alphabetical list... still - great to see BABYLONJS at the TOP! fb security policy has gone gonzo. Won't let me use the beautiful-falcon-face avatar - what? And - my location cannot be.. bermuda??? Seems like a cost for security is insecurity. Needs﻿ SSL. UPDATE - didn't find a FREE solution - had to plunk down about $100.00 (﻿everywhere I applied﻿ SSL). Yes, checked it out...letsencrypt gives the .crt cert file perfectly.. Although the certificate is free, you still need to upgrade your application to at least a Hobby plan to use it. So far - got the free cert, but hosts charge... to use it. Looking at -> GoD@ddy, NameCh3ap, Her0ku, dropb0x[?]). I usually use Linode or Digital Ocean and havent had any issues with letsencrypt on those. For SSL, have you considered CloudFlare.com? I use it for a few sites and you get free SSL and global caching. You just have to point your name servers at them so they front the traffic for your (it's safe, been using it for years). All free too (and I've run some high bandwidth sites on there). Both on list: DigitalOcean and Linode and Cloudflare, with letsencrypt, to see if hosting prices (including SSL) overall - end up less than ~$80. That's a goal. FINDING: Hosts find clever ways to add dollars! (WhoisGuard - lol). And -> there are often "hidden fees". GOAL: Looking for Fully-open-Source end-to-end "pipeline" - HTML5 Marketplace. STATUS: the last link in the chain ... is a jungle! Haven't found open-source equivalent of -> "Html5 Marketplace" (yet). #3) push direct-to-web - with FREE~STUFF! (80% there). nodejs backend; subs, paypal/patreon, ads (pay to remove), etc. Ready machete -> Into the ~Digital~Marketplace~Jungle! CloudFlare.com - didn't pop up on radar. Also... firebase? freemium, adSTACK, subs, silenceads, PayPal, Stripe, SendOwl. Heroku, Cloudflare, Linode, NameCheap, DigitalOcean, GoDaddy. Please share insight. Stuff might be cross-strack. How to integrate with HTML5 and BabylonJS? UPDATE: adSense is "approving" my site - got judgemental - and I moved on. LedBolt "approved" me in 1 day - and now I have ads. GumRoad - looks awesome for "digital content" - "creators" - of .pdf, .blender, .gltf, .exe, and .gif. BUT not .html creators??? <funny/>. I wrote suggesting a, embed paywall option- but then dug down in FAQ and found HTML Links "not in terms of service". After that, itch.io. UPDATE: itch does what I hoped GumRoad would do. NOTE: >> Every provider has unique hurdles in the approval process. Also myriad Approval Requirements and Technical Restriction. Kinda late to this, not really sure what you are trying to do here. I'm guessing you are trying to get yourself onto other platforms ? If so, the last few projects I've worked on were either (a) self-hosted route -> alpha, beta, blog, grow playerbase -> then the invitations come in from various platforms -> pick and choose (very impt!) -> hooking into provider APIs (nightmare of sorts) or (b) already established on publisher's platform -> prototype a new game with idea -> internal testing -> alpha, beta and the rest goes from there. Instead of trying to go wide early on which just confuses the heck out of your team, initial target is usually narrow focused. Cross that hurdle first and get good enough then the rest follows. I must say that 'getting good enough' means meeting the standard that's alr established on the platform you are aiming for. And that standard is all encompassing, from art, to UI, UX, gameplay, audio, vfx etc. So if your aim is Kongregate, its a very different standard there. On FB, another different beast etc. Alternatively, maybe you don't care about the A grade platforms, since competition is fierce there and you cant compete on budgets or quality. You just want to get your game out to whoever will publish for you. In that case, you could just spam out to the marketing depts of the lesser known platforms. Unfortunately, I don't have insight on this route and can't be more specific, sorry. Quality matters, that's all. Dunno if it helps, just sharing some experiences. Cheers ! As you say - navigating multiple platforms is like a nightmare. Like that. So far so good. The platform Stores, each have laborious "approval processes" - with unexpected requirements (STEAM does not payout until over 100, fb suspends accounts with bird avatar, etc). We like Itch.io very much. Kongregate is on the list. UPDATE: Deep-dive into Amazon... Fire. 5th Generation Fire Tablet tells us ... "WebGL not supported". With the fire tablet "Web App Tester"
After downloading 3 (unwanted) gigs of Android Studio. Keep bumping into these ... walled gardens. No like. Itch.io, didn't have any of these problems! So the search continues for "something like itch.io" - but on mobile app store. Had high hopes for Amazon. One thing that is nice about Amazon is they have PACKAGED APP fallback. Across multiple devices and 2 differnt BabylonJS apps? PWA's gain traction in 2018. For good reason... we really need it. Looks like Google and Microsoft efforts.